A Spanish family distinguished by the great number of its scholars and promoters of learning. The name is spelled in Hebrew variously, , (from an Arabic word meaning "present," "gift"). As early as the sixteenth century some of its members lived in Italy and Palestine; while another branch settled in the cities of Hamburg, Amsterdam, and London. In addition to those mentioned below, the following names are found in the list of the members of the Portuguese community at Amsterdam in 1675: Abraham Atias, Abraham Atias, "el viejo," Ḥayyim Franco Atias, Isaac de Semuel Atias, Isaac de David Atias, Jahacob Atias, Jahacob Costa Atias (De Castro, "De Syn. der Portug. -Israel. Gem. te Amsterdam," pp. xlviii. et seq. ; Steinschneider, in "Jewish Quarterly Review," xi. 480). Publicly burned, together with Jacob Rodriguez and Rachel Nunez Fernandez, on July 9, 1667, by the Inquisition at Cordova on account of his religion (Kayserling, "Sephardim," p. 263; Grätz, "Gesch. der Juden," x. 270). A printer in Amsterdam, 1728-41 (Steinschneider, "Jüd. Typographie" in Ersch and Gruber, "Encyklopädie," II. sec. J. 28, p. 67; idem, "Cat. Bodl." No. 7830). Ḥakam of the Portuguese community at Amsterdam from 1728 till his death March 22, 1753. Merchant, born at Leghorn. He was master of several modern languages, among them Servian, Russian, and Turkish, which he learned during his short stay at Constantinople. He wrote a book containing proverbs, fables,and sympathetic remedies, which was published in Hebrew characters under the title "La Guerta de Oro, o sea Tratamiento Gustoso, Saberoso y Provechoso," Leghorn, 1778. The book also contains "Lettres-Patentes du Roi Confirmatives des Priviléges, dont les Juifs Portugais Jouissent en France Depuis 1550," with a Ladino translation; and the outlines of a method of learning Italian and Greek in a short time contains also "sympathetic" remedies, a treatise on physiognomy, etc. ("Hebr. Bibl." xvi. 114). Printer at Amsterdam till 1707; son and business successor of Joseph Athias. The most elegant editions of Hebrew works, among them Maimonides' "Yad ha-Ḥazakah," etc., were issued by his office (Steinschneider, in Ersch and Gruber, "Encyklopädie," II. sec. J. 28, p. 66). 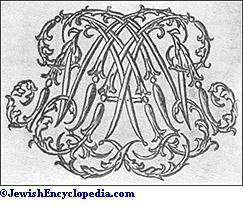 Ḥakam of the first Portuguese-Jewish congregation in Hamburg, and after 1622 at Venice, where he died. He was a pupil of Isaac Uzziel, and wrote in Spanish "Tesoro de Preceptos Donde se Encierran las Joyas de los Seyscientos y Treze Preceptos que Encomendò el Señor a su Pueblo Ysrael," Venice, 1627; second edition, Amsterdam, 1649. The first edition is dedicated to Elijah Aboab at Hamburg, and contains also "Dinim de Degollar por un Estilo Facilissimo y Breve." In 1621 he translated "Ḥiẓẓuḳ 'Emunah," a polemical work in defense of Judaism by Isaac Troki, a Karaite, which translation still exists in manuscript (see Grätz, "Gesch. der Juden," x. 20, 23). A prolific Italian writer on halakic, exegetical, and homiletical topics. His works, seven in number, were published at Leghorn—1793, 1821, 1823, 1825, and 1831. Wrote notes to the ritual codes and sermons of Caro, and published them under the title "Bigde Yesha'" (Garments of Salvation), Leghorn, 1853. On another Isaiah Athias, see Jellinek, "Ḳonṭres ha-Maspid," p. 28. Rabbi at Bayonne, France, during the first half of the nineteenth century. He died in 1842. See "Voice of Jacob," i. 198. Member of the Talmudical academy "'Eẓ Ḥayyim" at Amsterdam from the year 1737. 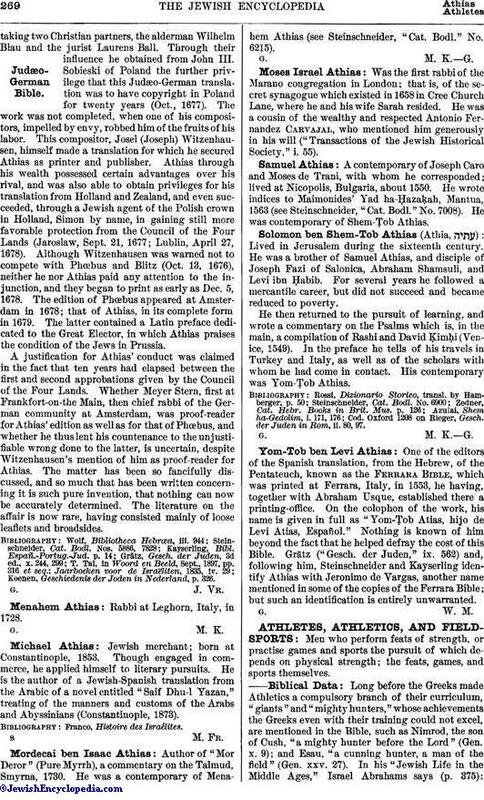 He was a son of David Israel Athias. 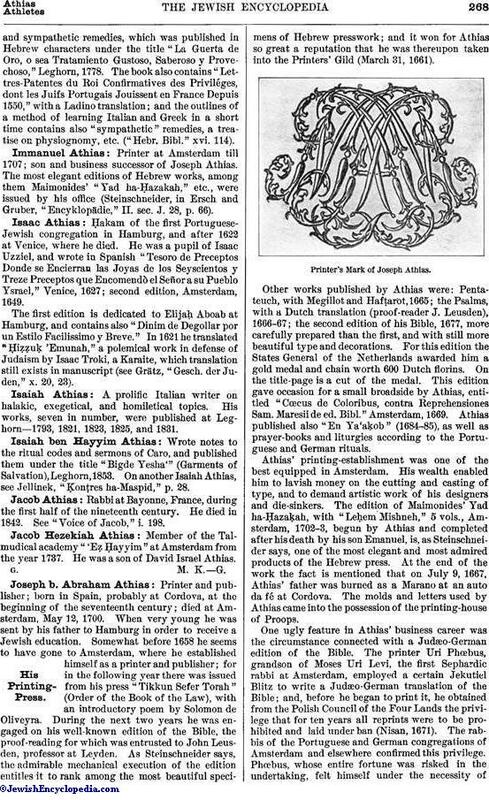 G. M. K. G.Joseph b. Abraham Athias: His Printing-Press. Printer and publisher; born in Spain, probably at Cordova, at the beginning of the seventeenth century; died at Amsterdam, May 12, 1700. When very young he was sent by his father to Hamburg in order to receive a Jewish education. Somewhat before 1658 he seems to have gone to Amsterdam, where he established himself as a printer and publisher; for in the following year there was issued from his press "Tikkun Sefer Torah" (Order of the Book of the Law), with an introductory poem by Solomon de Oliveyra. During the next two years he was engaged on his well-known edition of the Bible, the proof-reading for which was entrusted to John Leusden, professor at Leyden. As Steinschneider says, the admirable mechanical execution of the edition entitles it to rank among the most beautiful specimens of Hebrew presswork; and it won for Athias so great a reputation that he was thereupon taken into the Printers' Gild (March 31, 1661). Printer's Mark of Joseph Athias. Other works published by Athias were: Pentateuch, with Megillot and Hafṭarot, 1665; the Psalms, with a Dutch translation (proof-reader J. Leusden), 1666-67; the second edition of his Bible, 1677, more carefully prepared than the first, and with still more beautiful type and decorations. For this edition the States General of the Netherlands awarded him a gold medal and chain worth 600 Dutch florins. On the title-page is a cut of the medal. This edition gave occasion for a small broadside by Athias, entitled "Cœcus de Coloribus, contra Reprehensiones Sam. Maresii de ed. Bibl." Amsterdam, 1669. Athias published also "En Ya'aḳob" (1684-85), as well as prayer-books and liturgies according to the Portuguese and German rituals. Athias' printing-establishment was one of the best equipped in Amsterdam. His wealth enabled him to lavish money on the cutting and casting of type, and to demand artistic work of his designers and die-sinkers. The edition of Maimonides' Yad ha-Ḥazaḳah, with "Leḥem Mishneh," 5 vols., Amsterdam, 1702-3, begun by Athias and completed after his death by his son Emanuel, is, as Steinschneider says, one of the most elegant and most admired products of the Hebrew press. At the end of the work the fact is mentioned that on July 9, 1667, Athias' father was burned as a Marano at an auto da fé at Cordova. The molds and letters used by Athias came into the possession of the printing-house of Proops. One ugly feature in Athias' business career was the circumstance connected with a Judæo-German edition of the Bible. The printer Uri Phœbus, grandson of Moses Uri Levi, the first Sephardic rabbi at Amsterdam, employed a certain Jekutiel Blitz to write a Judæo-German translation of the Bible; and, before he began to print it, he obtained from the Polish Council of the Four Lands the privilege that for ten years all reprints were to be prohibited and laid under ban (Nisan, 1671). The rabbis of the Portuguese and German congregations of Amsterdam and elsewhere confirmed this privilege. Phœbus, whose entire fortune was risked in the undertaking, felt himself under the necessity oftaking two Christian partners, the alderman Wilhelm Blau and the jurist Laurens Ball. Through their influence he obtained from John III. Sobieski of Poland the further privilege that this Judæo-German translation was to have copyright in Poland for twenty years (Oct., 1677). The work was not completed, when one of his compositors, impelled by envy, robbed him of the fruits of his labor. This compositor, Josel (Joseph) Witzenhausen, himself made a translation for which he secured Athias as printer and publisher. Athias through his wealth possessed certain advantages over his rival, and was also able to obtain privileges for his translation from Holland and Zealand, and even succeeded, through a Jewish agent of the Polish crown in Holland, Simon by name, in gaining still more favorable protection from the Council of the Four Lands (Jaroslaw, Sept. 21, 1677; Lublin, April 27, 1678). Although Witzenhausen was warned not to compete with Phœbus and Blitz (Oct. 13, 1676), neither he nor Athias paid any attention to the injunction, and they began to print as early as Dec. 5, 1678. The edition of Phœbus appeared at Amsterdam in 1678; that of Athias, in its complete form in 1679. The latter contained a Latin preface dedicated to the Great Elector, in which Athias praises the condition of the Jews in Prussia. A justification for Athias' conduct was claimed in the fact that ten years had elapsed between the first and second approbations given by the Council of the Four Lands. 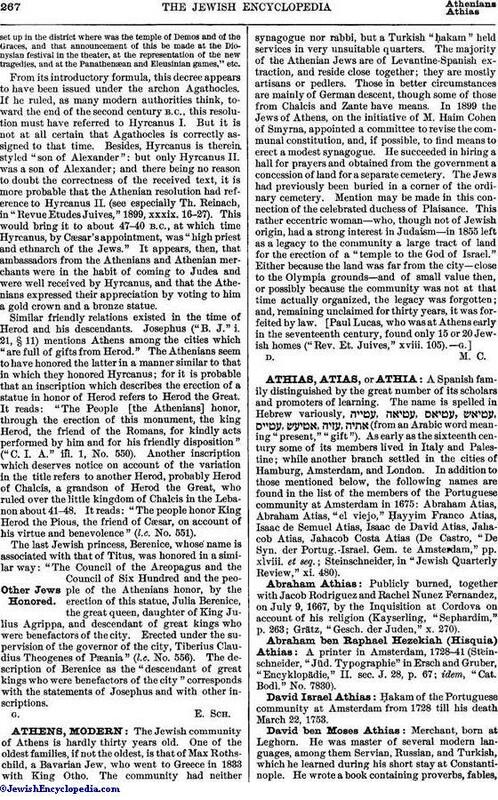 Whether Meyer Stern, first at Frankfort-on-the Main, then chief rabbi of the German community at Amsterdam, was proof-reader for Athias' edition as well as for that of Phœbus, and whether he thus lent his countenance to the unjustifiable wrong done to the latter, is uncertain, despite Witzenhausen's mention of him as proof-reader for Athias. The matter has been so fancifully discussed, and so much that has been written concerning it is such pure invention, that nothing can now be accurately determined. The literature on the affair is now rare, having consisted mainly of loose leaflets and broadsides. Koenen, Geschiedenis der Joden in Nederland, p. 326. Rabbi at Leghorn, Italy, in 1728. Jewish merchant; born at Constantinople, 1853. Though engaged in commerce, he applied himself to literary pursuits. He is the author of a Jewish-Spanish translation from the Arabic of a novel entitled "Saif Dhu-l Yazan," treating of the manners and customs of the Arabs and Abyssinians (Constantinople, 1873). Author of "Mor Deror" (Pure Myrrh), a commentary on the Talmud, Smyrna, 1730. He was a contemporary of Menahem Athias (see Steinschneider, "Cat. Bodl." No. 6215). Was the first rabbi of the Marano congregation in London; that is, of the secret synagogue which existed in 1658 in Cree Church Lane, where he and his wife Sarah resided. He was a cousin of the wealthy and respected Antonio Fernandez Carvajal, who mentioned him generously in his will ("Transactions of the Jewish Historical Society," i. 55). A contemporary of Joseph Caro and Moses de Trani, with whom he corresponded; lived at Nicopolis, Bulgaria, about 1550. He wrote indices to Maimonides' Yad ha-Ḥazaḳah, Mantua, 1563 (see Steinschneider, "Cat. Bodl." No. 7008). He was contemporary of Shem-Ṭob Athias. Lived in Jerusalem during the sixteenth century. He was a brother of Samuel Athias, and disciple of Joseph Fazi of Salonica, Abraham Shamsuli, and Levi ibn Ḥabib. For several years he followed a mercantile career, but did not succeed and became reduced to poverty. He then returned to the pursuit of learning, and wrote a commentary on the Psalms which is, in the main, a compilation of Rashi and David Ḳimḥi (Venice, 1549). In the preface he tells of his travels in Turkey and Italy, as well as of the scholars with whom be had come in contact. His contemporary was Yom-Ṭob Athias. Cod. Oxford 1208 on Rieger, Gesch. der Juden in Rom, ii. 80, 97. One of the editors of the Spanish translation, from the Hebrew, of the Pentateuch, known as the Ferrara Bible, which was printed at Ferrara, Italy, in 1553, he having, together with Abraham Usque, established there a printing-office. On the colophon of the work, his name is given in full as "Yom-Ṭob Atias, hijo de Levi Atias, Español." Nothing is known of him beyond the fact that he helped defray the cost of this Bible. Grätz ("Gesch. der Juden," ix. 562) and, following him, Steinschneider and Kayserling identify Athias with Jeronimo de Vargas, another name mentioned in some of the copies of the Ferrara Bible; but such an identification is entirely unwarranted.